From Viñales, we booked a taxi ride to Cienfuegos. If you plan to go by taxi, I highly recommend booking via the Cuba Taxi office in the main square of Viñales as they can almost match the price of the Viazul bus company. The journey takes around 4 hours and ours included a change of taxis at the worst motorway service station I’ve ever seen. After a trip to the worst smelling men’s toilet I’ve ever come across as the ladies’ was nowhere in sight (top tip: pack hand sanitiser and toilet roll for your trip to Cuba), we jumped into a car driven by the liveliest taxi driver we met on our trip, who drove at the speed of light and kept chanting “Ciennnnnfueeegos!” at the top of his lungs. His excitement was palpable, but after our visit to the city we couldn’t help but wonder why. Cienfuegos is pretty. 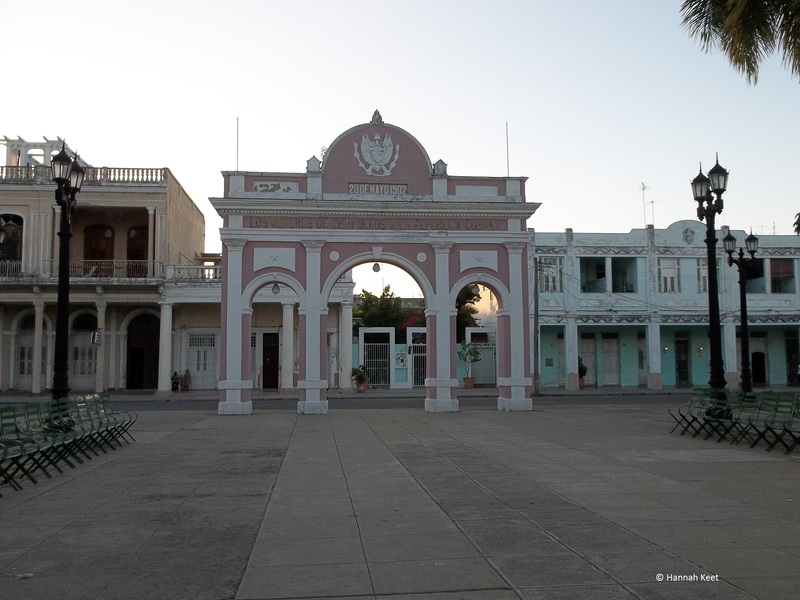 Its main square, Parque Martí, hosts most of the attractions listed under Cienfuegos in Lonely Planet, and is a sight to behold with its vibrant colours and French and Italian neoclassical buildings, but it’s certainly not the amazing place Lonely Planet makes it out to be. If you’re short on time and need to cut a destination from your trip, I’d say this would be it. The next day, at a loss for what to do, we did what all tourists do in Cuba when they’re out of options: we hit the beach. The good thing about staying in casas is that nothing is too much trouble for them. If you need to get somewhere by car, they’ll sort it out for you, no problem. The driver that our casa owner booked for us drove an old American car, bonus! Well, not quite, as his air freshener was somewhat pungent and stomach churning. But who cares? We were off to the beach! Walking along the beach, we couldn’t help but notice the massive swarms of dragonflies swarming above the sand on the lookout for their lunch. Don’t let this put you off, they completely ignored us, even swerving out of the way when we fancied a dip in the sea (and this coming from the woman who’s highly prone to insect bites). Lifeguards are pretty chilled out here; one was even offering massages and wanted to party that evening (we politely declined). We decided to make the pilgrimage to Santa Clara the next day, opting for a day trip rather than a longer stay. Be prepared for long queues at the Che Guevara Mausoleum regardless of the time of day. We got there pretty early and still waited quite a long time. Once in, you can see the remains of Che and his six comrades and then cross over to see the museum dedicated to Che’s life. Entry to both is free, but you’re not allowed to take pictures. There’s even an attendant in the mausoleum keeping a watchful eye on untrustworthy tourists. A walk around the surrounding area is also worth it to see the tombs of other comrades and the flame lit in their honour. After this we headed to the Monumento a la Toma del Tren Blindado, a “museum” marking the spot where Che & co. derailed an armoured train which was the start of the Batista regime’s downfall. 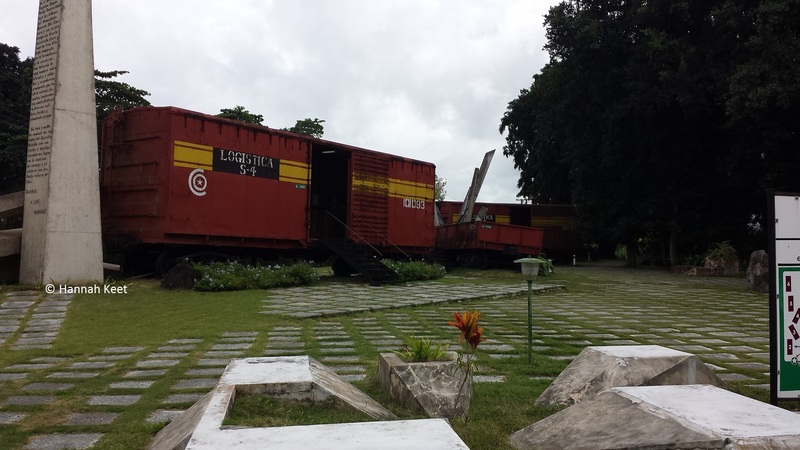 The exhibition is located within train carriages with pieces of rail track upended outside them and the bulldozer that helped the rebels sitting in the corner. Entry costs CUC 2* without a camera or CUC 3 with a camera. I paid to take pictures, but you could feasibly get away with not paying the extra CUC if you’re so inclined. Watch out for Cubans selling their CUP 3 notes on the side of the museum. They have Che on them but they’re worth far less than CUC 3, or even CUC 1 (not to mention you’re not supposed to take Cuban currency out of the country). 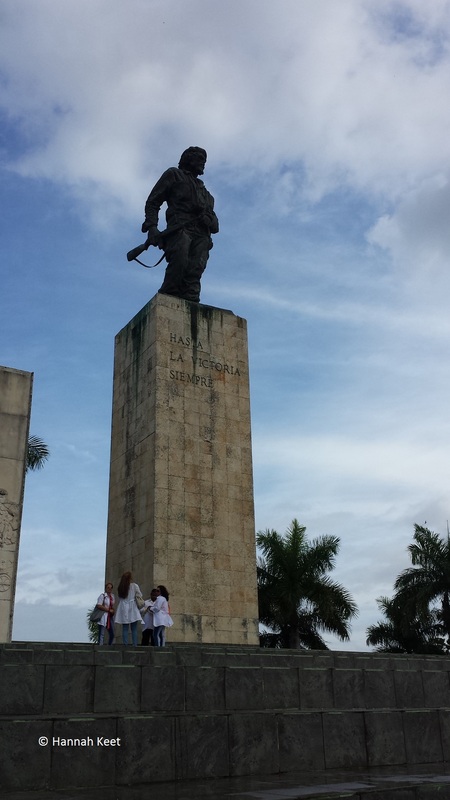 The last stop on our whistle-stop tour of Santa Clara took us to its main square, Parque Vidal. Billed by Lonely Planet as “one of the nation’s busiest and most vibrant parks”, what we experienced was something totally different. Far from it buzzing with students, we encountered begging pensioners who would pop up just as you were about to open your wallet at the market on one side of the square, and again when we sat on one of the park’s benches. They don’t take no for an answer. Scuttling back to our driver, who was parked on a side street, we were fairly surprised to see that that was the last stop of our tour. No toilet break, no lunch stop, we were whisked back to Cienfuegos and home within half a day! Travelled between: late November and early December 2014.